Ecommerce is poised to disrupt the home improvement industry, thanks to a number of longer-term dynamics. To evaluate the ecommerce potential of a building product, L.E.K. has developed five criteria that together comprise an index called E-SHIP. Another way to assess ecommerce potential is to understand the demand moments, or interactions, that homeowners and contractors have with each category. Both approaches help the industry break down ecommerce opportunities within the status quo. However, incumbent players also must weigh what it would take for the status quo to change. Disciplined consideration of future scenarios can help companies think through the implications and develop an effective ecommerce strategy to address them. 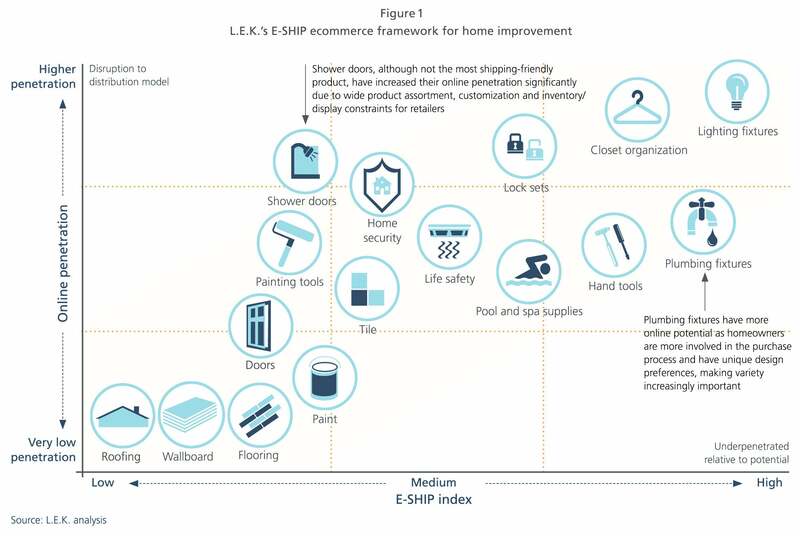 Ecommerce in the home improvement industry has the potential to disrupt the value chain. Incumbent players — both manufacturers and distributors/retailers — need to capitalize on the opportunity and defend against the risk. To date, ecommerce penetration in building products lags many consumer product categories. Because of this dynamic, ecommerce does not receive nearly the same attention in residential building products as it does in consumer products. It should. Amazon in home improvement could likely be larger than Menards (total company) in 2018. Ecommerce penetration among contractors is increasing every year, and the actual penetration has been higher than anticipated the year before (for each of the past five years); actuals exceed expectations. This is particularly true among the rising millennial contractor generation — in L.E.K. Consulting’s annual contractor survey, millennial contractors report 50% higher purchasing online versus nonmillennial contractors. Homeowners are increasingly “empowered” in their decisionmaking and turn to the internet for product choices, design advice, feedback and even installation support. Conventional channels (pro and big box) had reduced sales support and advice capability during the Great Recession in an effort to survive. The move, while sensible at the time, trained customers to be more self-sufficient. This empowerment feeds into the online value proposition. Industry leaders in residential building products are racing to get in front of the opportunity and challenge. Leading manufacturers are investing in downstream demand-generation ecommerce tools while paving the way for direct-ship. Distributors, both pro and big box, are investing in capabilities to become multi-/omnichannel. How the dynamics will play out remains to be seen. However, we believe both the disruption and the opportunity are being underestimated in residential building products. We see too many companies looking at the ecommerce channel and offering platitudes about why it isn’t a threat, shouldn’t be a priority, etc. This thinking is dangerous. In this Executive Insights, we explore the trends around building products ecommerce and discuss the potential implications across the value chain. The purpose of the article is not to be prescriptive with solutions as those will differ by category, role in the value chain, customer type and company capabilities. Rather, our objective is to help create an industry call to action to capitalize on the opportunities and defend against the threats. L.E.K. has developed a framework — E-SHIP — to identify and evaluate categories that are more likely to go online given the current competition and roles within the value chain (see Figure 1). Applying the framework to the industry explains why a number of categories have been the first to move online. Plumbing and lighting fixtures, for example, score high on the criteria, while wallboard does not. The framework helps the industry consider penetration opportunities within the status quo. However, the residential building products industry should be thinking about more than the status quo. Ecommerce’s ability to penetrate a category depends as much on the category attributes (as mentioned above) as it does on how homeowners and contractors interact with the category. We refer to these interactions as demand moments. Each demand moment has a different opportunity for potential ecommerce penetration. The planned purchase currently has the highest opportunity, whereas the other three types of demand tend to be a poorer fit for ecommerce. When coupled with the E-SHIP assessment, the conclusion could be that much of the building products industry is immune to ecommerce. Again, we believe this thinking is risky. What would it take for the status quo to change? Breaking down the barriers to the ecommerce penetration constraints mentioned above is not difficult to envision. Take the constraint of job site delivery as an example. Existing building products distributors in many categories perform this service on an hourly basis. Historically, this service has been seen as a barrier to entry for ecommerce. However, are any of the following scenarios difficult to imagine in terms of how ecommerce could become more relevant to companies providing this service in the years ahead? Incumbent pro distributors with delivery could add a world-class ecommerce front end (merchandising, order entry, estimation, job tracking, etc.) to their existing offering and facilitate the contractor ordering online. Ecommerce players could provide the front end in collaboration with the pro distributors on the back end holding the inventory and performing the fulfillment (thereby breaking apart profit pools). Sound familiar? It should. It is analogous to Amazon’s Marketplace program in consumer products. Why couldn’t it happen in building products? Ecommerce players could choose to enter the space (organically or inorganically) and hold inventory, run branches and perform job site delivery themselves. Seem unlikely? Then think about Jeff Bezos’ infamous quote of “your profit is my opportunity” and Amazon’s recent acquisition of Whole Foods as evidence of the company’s willingness to compete in different parts of the value chain with complementary capabilities in order to access markets and capture profits. Are the above disruption scenarios unique to job site delivery? No. What is the future state (or scenarios) for ecommerce in my industry? How does this future state help or hinder my business? If I am threatened by the future state, what actions can I (should I) be taking now to influence this outcome favorably (or to reposition my business)? Likewise, if the future state is potentially attractive, what actions can I (should I) be taking now to best capitalize on the opportunity? How do the answers to the above questions inform key elements of my business planning and strategy? How do I think about customer segmentation, purchase process and customer needs? How do I think about product positioning? How do I think about channel priorities (and conflicts)? How do I think about demand-generation investments — sales force, brand building, pricing, etc.? How do I think about competitive differentiation? How do I think about operational and business model decisions (distribution centers, supply chain, etc.)? How will the profit pools in the industry potentially change? What specific ecommerce investments should I be making? These questions require careful attention. We can help. Since 2013, we have handled more than 50 projects in building products in North America in which the topic of ecommerce’s evolution has been central to the assessment. Let us share these experiences and perspectives to help you maximize your digital future.